All of us are likely to need care at some point in our lives. Old age. Illness. Disability. You and your family may need to rely on carers, whether in your own home or in a care home. Caring is a hugely important job. Calling in on vulnerable people, helping them wash and dress, cleaning and tidying, giving them medicine, preparing their meals, keeping them company. As a care worker, you might be the only person they see all day. People's lives are damaged by cuts and privatisation of care - carers feeling stressed and rushed, older people feeling lonely and uncared for. We need to start putting people first, not profit. Privatisation hasn't worked. Two-thirds of adult social care workers say the quality of adult care has dropped because of large-scale outsourcing since the early 1990s. 1 in 4 home care services are failing to meet quality and safety standards. 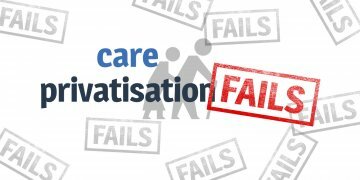 "Both the quality of care in adult social care and the terms and conditions of the workforce have declined over the past two decades as a result of privatisation...Turnover rates are higher, and rates of pay considerably lower, in the private care sector than in the public sector." Care workers are responsible for taking care of older and vulnerable people in their homes - but they're under a lot of pressure. Care workers are rushed. With visits of 15 minutes and packed schedules, they barely have time to take their coats off and make a cup of tea for the person they're looking after. Private care workers don't get paid enough. Up to 220,000 care workers are paid less than the national minimum wage, often because they are not paid for travel time. These carers are mostly women and many are migrants. Private care workers are more likely to be on a 'zero hours' contracts. Many care home providers are large chains, backed by private equity and relying on risky financial structures. If they collapse, as Southern Cross did in 2011, the consequences for the people living there are damaging. 380 care home businesses have been declared insolvent since 2010, leading Labour leader Jeremy Corbyn to commit to bringing failed care homes into public ownership. By 2040 almost one in four of us will be over 65. What kind of future do we want for care work? UNISON's Ethical Care Charter spells out some key standards that local authorities should meet when they agree care contracts - you can write to your councillors to ask them to sign it. Shareholder profits. Private care providers expect a profit margin of 12% - we could cut that out altogether. Private company executive salaries. Chairman of Mears home care company Bob Holt took home £350,000 in salary, pension and other benefits in 2015. Procurement costs and picking up the pieces when things go wrong. Most importantly, caring for people properly is about having a civilised society where everyone is treated with dignity. Don't we all want that? 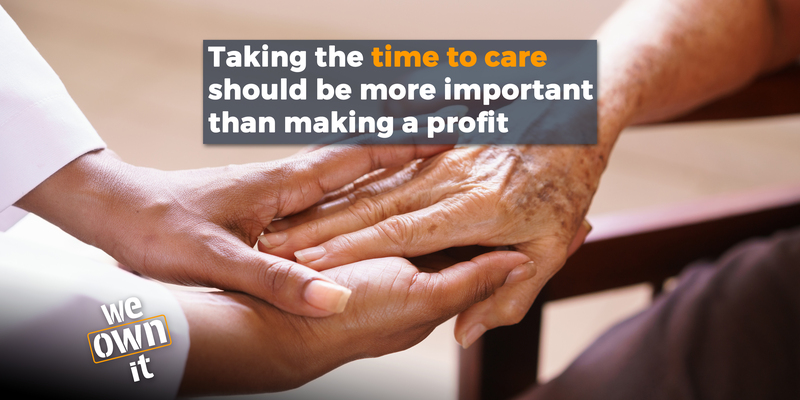 Share this page if you believe in caring for people, not profit. Adult social care: is privatisation irreversible?